The tradition of one hunger strike a year in Santa Clara County jails since 2016 continues, as the majority of inmates have not ordered food from the commissary since Sunday, according to a local advocacy group organizer. Silicon Valley De-Bug organizer and columnist Jose Valle said that he knows from being in close contact with inmates and their family members through the advocacy group that the fourth, fifth and seventh floor of the main jail are definitely participating in the ongoing hunger strike. 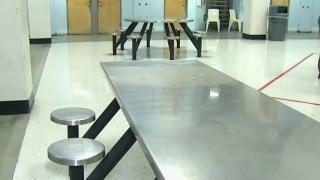 He estimated 80 to 90 percent of inmates have joined in. The hunger strike, taking place at both the Santa Clara County Main Jail in San Jose and the Elmwood Correctional Facility in Milpitas, is intended to bring four main concerns to light: the inmate classification system, the uncertainty of solitary confinement, how grievances are filed and access to sanitary surroundings. "The moment someone is incarcerated, they're classified based on who [authorities] think they are or what they think that person is going to do," Valle said. "That information could be anything from their charges to their gang allegations to court testimony." The inmate classification system determines what conditions the detained are in while in custody, ranging from regular security to solitary confinement. Valle said that because three-fourths of the inmates in the county are pre-trial, they've been waiting years in the same classification based on the charges. The number of those in solitary confinement has declined in the last two to three years, thanks to the efforts of county leaders, Valle said. Time out of cell has improved, but there is no clarity as to how long someone will be in the severe classification, Valle said. Valle compared those classified as regular security and those classified for solitary confinement to white men in upper middle class communities and Hispanic men like himself in lower class communities. "My access to resources and privileges are going to be a whole lot different," he said. Valle added that those in solitary confinement get only mail, visits through glass and varying levels of cleanliness. There are no options like newly offered college courses. The death of Michael Tyree at the hands of three former correctional officers in 2015 shook the entire county jail system and brought forth many efforts toward reform, which included inmates voicing more of their concerns through grievances, Valle explained. While the number of grievances has increased, those in custody don't believe the complaints are doing them justice as the on-shift sergeant who takes the written complaint types up their own summary. "It's going to leave some room for opinion, because it's not going to be exactly what the detainee wrote," the organizer said. "So not only is it a summary, but an interpretation." The last demand, time for inmates to clean their surroundings and clothing and the items necessary to do so, should be considered a right but is not guaranteed in Santa Clara County jails, Valle said. "There's up to 100 men living in the same area, sharing the same space and using the same bathrooms," Valle said. "So keeping an area clean is a top priority." From here out, it's up to administrators to make decisions that will bring forth these benefits to the incarcerated, Valle said. He noted that with last year's hunger strike Sheriff Laurie Smith and her office seemed more supportive of the movement. "I think once it came closer to the election, Smith felt pressured to have a certain stance in all of this," Valle said. "Even though she has stated that she isn't going to meet the demands of the inmate population, some of her administrators have sat down and negotiated and met some demands." This time around, Santa Clara County sheriff's officials are acknowledging the strike and calling it "an unproductive negotiating tactic for change." The officials said today that custody improvements and reforms would continue as scheduled irrespective of the protest, which they believe was, "instigated by a select few individuals." Sheriff's officials concluded their statement by saying that the health and safety of staff, visitors and inmates is the top priority and so medical staff will be evaluating all participants for the duration of the hunger strike. Valle said it's common practice for inmates to even throw away old food from the commissary that they had before the protest to show solidarity. "The inmates have no desire not to eat or risk their health," Valle said after talking to some of the guys on the inside. "When someone chooses to go on a hunger strike, it's their last straw. It should show how much of a concern this really is."